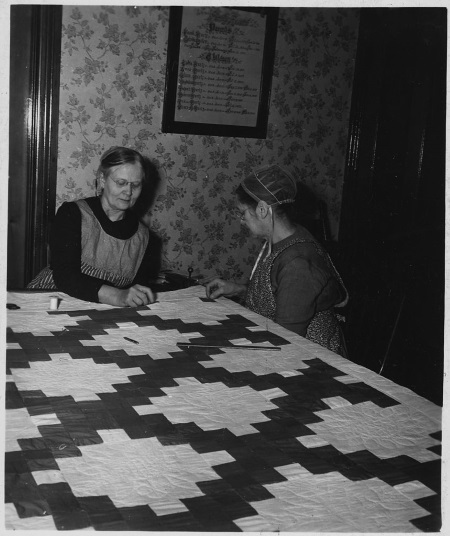 In today’s post, Janneken Smucker gives us a glimpse of the homes and quilts of “Church Amish” in Lancaster County, over 70 years ago. Recently my research interests have expanded from Amish quilts to New Deal era photography. Luckily, there is a small group of photographs in which these two topics perfectly mesh: photographs Irving Rusinow took of Amish and Mennonites in Lancaster County, Pennsylvania, during the early 1940s under the employment of the U.S. Department of Agriculture’s Bureau of Agricultural Economics, which commissioned him for the American Farm Community Study, one of the many New Deal era programs aimed at determining both the ills and successes of rural America. 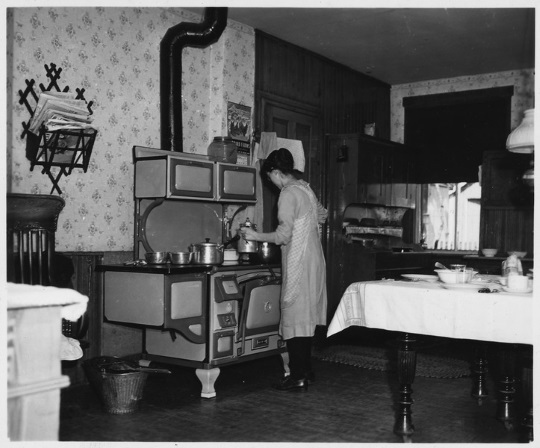 In the photographic archive of Rusinow’s work on this project are a handful of photographs depicting domestic interiors of what he labeled as “Church Amish” homes. Based on an accompanying 1942 report produced by the Bureau of Agricultural Economics, “Church Amish” referred to what many call the “Amish-Mennonites”—the somewhat less conservative groups that formed following the 19th-century “Old Order” split who were distinct from the Old Order Amish, among other reasons, because they met in church meetinghouses rather than homes for worship. For this community study, Rusinow received permission from the Amish community in Lancaster County to photograph men, but not women. As art historian Elizabeth Bennett suggests, Rusinow’s photographs of Church Amish interiors absent the women who usually inhabited them, allowed the objects, including needlework in use and in process, to stand in for the women themselves. 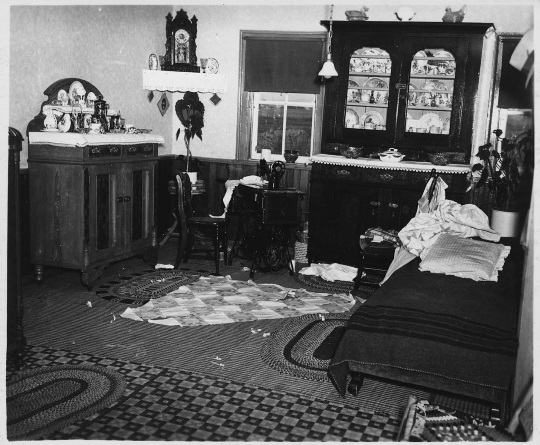 I am particularly enamored with Rusinow’s 1941 photograph with a half-pieced quilt lying on the floor of a Church Amish living room. It appears as though the woman of the house just stepped away from her sewing, leaving her treadle sewing machine and quilt project. Figure 1. Arthur Rusinow, March 19, 1941, Department of Agriculture. Bureau of Agricultural Economics. National Archives and Records Administration. We unfortunately do not have enough information to know where this Amish home falls on the spectrum of conservatism, between Old Order and Mennonite. But we can see that this family embraced material goods: china on display in a cupboard, an ornamental clock, rugs on the floor, just as many contemporary Amish families do. I’m uncertain how Rusinow received permission to photograph these women in the midst of their work, if other times he was not allowed. Based on the fancy wallpaper and printed fabrics worn by the women, this is likely a less conservative home. Figure 2. Irving Rusinow, March 20, 1941, Department of Agriculture. Bureau of Agricultural Economics. National Archives and Records Administration. These photographs offer a rare glimpse into the intimate worlds of Amish and Mennonites from over 70 years ago. At that time, New Deal projects considered the Amish as a success story which other rural Americans might emulate in order to help lift themselves out of the Depression. Today, they serve as a valuable window into the lives of Amish and Mennonites from this long-gone era. Update: here is another photo from Rusinow’s collection, showing an overall plainer appearance, entitled “Lancaster County, Pennsylvania. 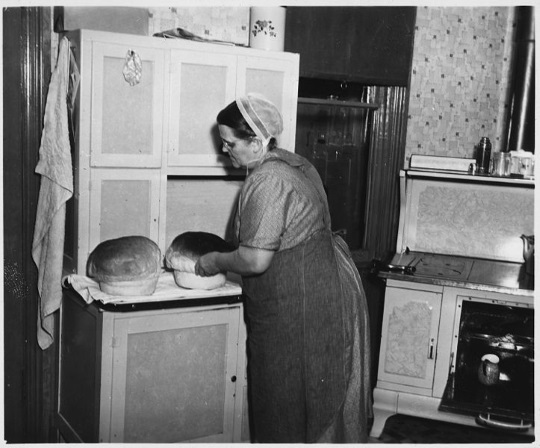 This Church Amish housewife is engaged in the rapidly disappering practice of baking bread. Note the devotional head-covering which is worn in accordance with I Corinthians 11:1-16.” Hat tip to J. Lapp. -ed. Update #2: Here are three more examples of Rusinow’s photos of people, two using the “Church Amish” term, and one using “Conservative Mennonite”. Two are of women, one of men. I’ve heard the term, but never understood it. I also never knew what connection this group had to the New Deal. Love learning new things about them. Great photos! These are possibly Old Order Mennonites (Wenger/Horning)according to the dress and house styles. My wife’s grandmothers (both Horning, and in their 90s) match those two women to a tee. Or, at that time even the Lancaster Conference would have held to similar dress patterns, although today most of the Lancaster Conference Mennonites have acculturated enough that little outward “non-conformity” is found. So they could be Lancaster Conference. All the Mennonites in Lancaster County use meeting houses. Now that I think of it, those two women are probably Lancaster Conference Mennonites, since the Old Order would not have allowed their photos, but the Lancaster Conference may have permitted photos at that time. I love old photographs, too. I wish I could see what the pattern is on the old Singer sewing machine. My dad collects and restores them, and the one in the photo looks just like the one he gave me. In our church (in some of the congregation would label themselves Beachy Amish Mennonite, and others would just say conservative Mennonite), there is a strong emphasis on hospitality. Women want their homes to reflect the Godly values that we want for our families, and also to be a comfortable place for guests. Members are reminded that modesty includes not just dress, but also behavior, home furnishings, and lifestyle, although our church has very few actual regulations concerning material goods. The ladies tend to be very good bargain hunters. One has a large and beautiful china set for serving meals to guests, which she got for next to nothing at a yard sale. Another has a beautiful hardwood table and chairs that went for very little at an auction. These few examples represent the norm. So while material goods are embraced, homemakers put a lot of time and effort into procuring nice things for less, making their own, and finding other creative ways to make their home into welcoming sanctuaries for family and guests. The hanging electric light and the hat in the first picture, and the head coverings, print-material aprons and flowered wallpaper in the second photo, make me think this is Mennonite instead of Amish. I need more explanation of “Church Amish.” The window blinds and the treadle sewing machine look Amish. If only we could read the last name on the family record, it would be a great clue! I am a member of a Church Amish group (Beachy affliation). And I too immediately noticed signs that the second photo may be Mennonite. The covering style is the most obvious, followed by some of the facial features, and then the print aprons and wallpaper (the last two by themselves may not definitely rule out all mid-century Church Amish). Am I imagining that the last name is “Kurtz” in that family record? Interesting. We’re into two areas that are not my strong suits (Mennonites/history) so I can’t add much, though I wonder if this means the photo was mislabeled. There are a number of other photos labeled with the term “Church Amish” in the collection. How broadly is/was the term applied? I can see a difference in head covering and an overall plainer appearance in the photo of the woman baking which you shared. It would also raise a similar question to that raised by Janneken, as to how the woman in the baking photo permitted it (given the “men only” stipulation). For anyone who wants to see it, I added the photo to the post above along with its caption. The new photo has a Lancaster Amish covering and hair style. To outsiders, the differences are subtle. I would guess the “Amish” lady is a Beachy Amish, as Old Order would definitely not have allowed photos in those days. But maybe the photographer “sneaked” a photo. I am thinking the Beachy Amish in Lancaster had their beginnings in the 1910-1920 time frame but dont have the info in front of me at the moment. The New Order in Lancaster began in 1960s. By Amish hair style, I mean the rolled hair coming around the forehead. Lancaster Amish are the only ones I know that use that style. I just added three more photos above, along with their captions. Curious what those more familiar with these groups/era might have to say about them. In two of the photos Rusinow uses “Church Amish”, while in one he uses “Conservative Mennonite”. Two are of women, one of men. 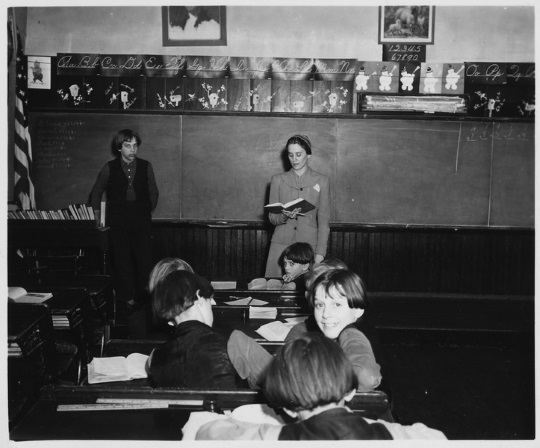 About the new photos—is the school a public or an Amish/Mennonite school? I don’t think I’ve seen American flags in present-day photos of Amish schools, so I was wondering about it. It also looks like a picture of George Washington on the wall above the blackboard. 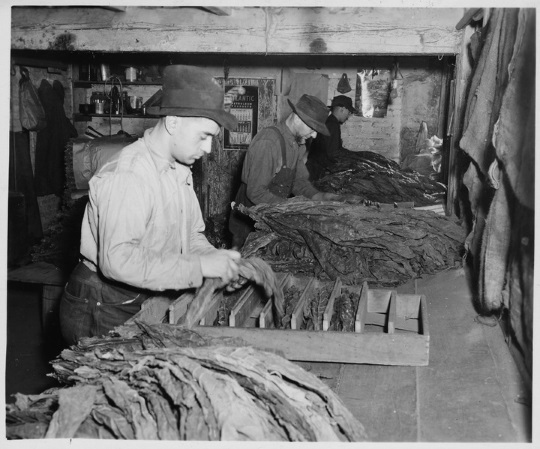 The men in the tobacco-stripping shot don’t seem to have long hair (or beards). In fact, a couple of them seem clean shaven (face & head–at least what is shown below the hat brim). Any comments about it? It seems unusual. I suppose the Amish got more conservative over the years? Those are most likely Mennonites. The clean shaven, colorful wall patterns, and a few other things show that those aren’t Amish. Their likely Mennonites. I wouldn’t consider them “Beachy Amish”, because the Beachy Amish are more liberal in dress and plainness than what is shown in the photos. I don’t consider the Beachy Amish churches to be Amish, their far too liberal and removed from Amish traditions. They drives cars, worship in churches, use most technology, do outreach work, and modesty depends a lot of times in a Beachy congregation on the individual rather than as a uniformed practice. I can add nothing to this discussion, except to thank everyone who has commented so far for sharing very interesting information, but I wanted to leave a comment so I could sign up for notifications of new comments on it. These scenes could be of my old home in Chicago when my Dad’s Mother lived there. Catholic background, during WWII (blackout shades)…same light fixture we had in the hallway outside her flat. So many similarities with Amish/Mennonites—which is why this blog is so interesting to me. It is funny that you made these comments, as I was thinking the EXACT same thing about the home of a family member who died at age 90 about 1969 or ’70. I can’t remember anything prior to about 1959 or 1960, but in the early 60’s my mother would visit her favorite relative … her Aunt Mary (Salzmann)in San Antonio, Texas and she would take me along with her. It is those trips that I remember most about visiting my mother’s family, as sometimes other family members would come over and visit too while we were there. Few brought along any children, so all there was for me to do was sit and take it all in. I am glad now that it worked out that way. Some of these photos could easily have been taken in her little house, which had not been updated in probably 30 or 40 years at that point. They too were Catholic and were raised in the Alsatian farming communities southwest of San Antonio. Small world, isn’t it? I’ll preface my comments by saying I’m not from the Lancaster County community, so I don’t know all the nuances between the groups in this area. But some of my Indiana and Ohio ancestors would have likely been “Church Amish” in the early decades of the 20th century, in that they met in meetinghouses instead of churches, and would have classified under the larger umbrella of “Amish-Mennonite,” meaning those Amish who did not affiliate with the Old Order following the late 19th century sorting out process. So “Church Amish” may not have been a strictly defined term, but it may have included various of the Amish and Mennonite groups who still dressed plainly but met in churches. This 1959 article from the Mennonite Encyclopedia simply contrasts the “Church Amish” with the “House Amish” (see the second paragraph. Many Amish-Mennonite groups from this era eventually joined the Mennonite Church (Old Mennonites or MC as it was known). Kollmorgen’s report lists some numbers from the 1930 census, which included 300 farmers in Leacock Township in Lancaster County. These are the terms used on the census, from what I can tell. 168 (or 55%) of farmers were Old Order Amish, 52 were Mennonite, 23 were Amish-Mennonite or Church Amish, 2 were Dunkers, and 55 were non-Plain People. This suggests that Kollmorgen used the term Church Amish interchangeably with Amish-Mennonite, meaning the groups, that were not Old Order but had not joined up with the Mennonite Church. I met you briefly at the 2013 Etown conference and have really enjoyed your work on quilts. Yes, the way you describe the “Church Amish” in consistent with my understanding. Most have used it interchangeably with “Amish Mennonite” to describe Amish groups who have not either joined or created Mennonite conferences. It does seem to me, as somebody else pointed out, that Rusinow did not completely understand the distinction between different groups (not all that uncommomn or surprising). Unlike in Ohio and Indiana, Lancaster County only ever had 3 congregations that were ever considered “Church Amish.” By the mid-1940s, the first two (Conestoga and Millwood) had joined Mennonite Conferences, which only left Weavertown. By the 1950s this last congregation could be described as Beachy Amish (prior to that, they would have been identified as “Church Amish,” “John A.” or “Peachey”). I have no doubt that the lady baking belonged to the Weavertown congregation, and with a little help from some relatives I should be able to identify her by name. I really appreciate you providing these details. I knew someone out there would be able to narrow this down for us. And wouldn’t that be exciting to identify some of the individuals in the photos! PS — I do remember meeting you at E-Town. Great to hear from you! “…our family would visit the maker of that quilt, Mary Longenecker, my maternal grandmother whom we called Maw Maw. After Maw Maw and her husband, whom we called Paw Paw, retired from their farm, they bought a small one-story gray limestone house fronting on Route 422 just east of Lebanon, Pa.
For years she was part of a group of women quilters at the Midway Church of the Brethren, where each week they met and together made what we later learned were those popular Pennsylvania Dutch quilts. The history of quilting in the United States has sometimes been called “herstory” since the stories told by quilts are usually women’s stories written in fabric rather than in words. The lady with the bread is my Grandma Hannah Beiler Smoker. My grandparents left the Amish around 1918 or 1919 to help with the Weavertown “Beachy” Amish church in Lancaster County. As a child in the 50s I said my grandparents were “Church Amish” because they dressed Amish but had a car, electricity in the home and worshiped in a church building. My dad did not “join” church at Weavertown. As a teen he started attending a Lancaster Conference Mennonite Church. Today the Weavertown Beachy Amish church is Weavertown Amish Mennonite church. I have a rich heritage..Amish, Beachy Mennonite, and Mennonite! !